1776 Pyramids -  An epic journey of new discovery so fantastic that our natural instinct would be to block it out. No one really knows how or when the 1,776 Hershey’s Kisses shaped hills were either formed or constructed near Bohol, Philippines. The hills range in height between 150 to 450 feet high and are very regular in shape. They are cool though and remind us of the The Pyramidal Hills of Luoping, China (pictured, right) which everyone concedes; are man made, no? 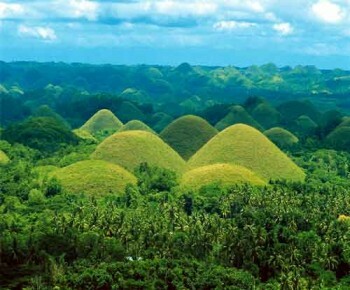 “The Chocolate Hills are an unusual geological formation in Bohol, Philippines. According to the latest accurate survey done, there are 1,776 hills spread over an area of more than 50 square kilometres (20 sq mi). They are covered in green grass that turns brown during the dry season, hence the name." 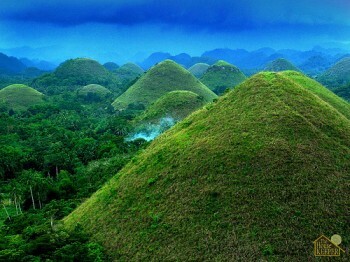 The Chocolate Hills is a rolling terrain of haycock hills – mounds of general shape which are conical and almost symmetrical. 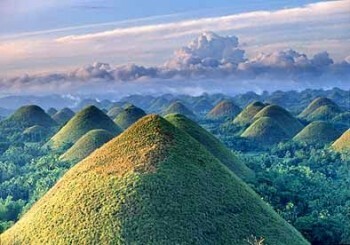 Estimated to be 1,776, these cone-shaped or dome-shaped hills are actually made of grass-covered limestone. The domes vary in sizes from 30 to 50 metres (98 to 160 ft) high with the largest being 120 metres (390 ft) in height. 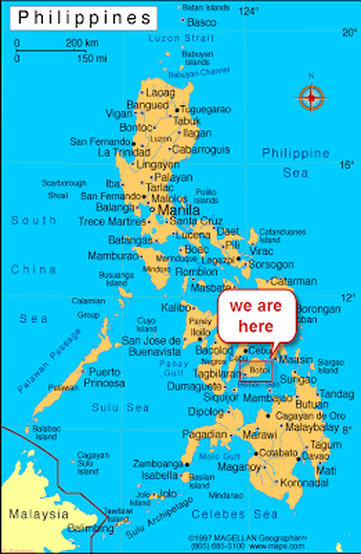 They are scattered throughout the towns of Carmen, Batuan and Sagbayan in Bohol. 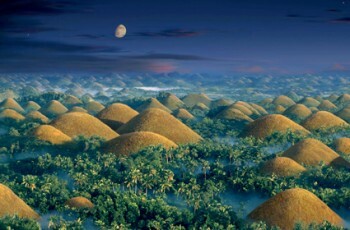 Bohol’s “main attraction”, these unique mound-shaped hills are scattered by the hundreds on the island’s central plain, concentrated near the town of Carmen. At dawn or at sunset, the Chocolate Hills are an alluring sight; the whole area picturesque amidst the rice fields and the clusters of houses made of the diamond patterned sawali or bamboo slats. During the dry season, the precipitation is inadequate such that the grass-covered hills dry up and turn chocolate brown. This transforms the area into seemingly endless rows of “chocolate kisses”. The branded confection is the inspiration behind the name, Chocolate Hills.